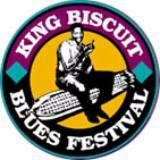 Well, actually it is the Arkansas Blues and Heritage Festival now, because the King Biscuit name was bought by a corporation and they did not want the name used for the festival any longer. Those who are long time fans, still refer to it as simply "The Biscuit". Greatest thing it is $25.00/person for the Festival. That is not $25/day...but $25 for ALL THREE DAYS! I will have 100's of pictures when I return next week and I am also hoping to do a few interviews while there that I can play on MUSIC ON THE COUCH. You're going to have a GREAT time! Wish we could be there too. I KNOW you're having fun; I saw Nancy's photos!